The U.S. isn’t the only one scheduled to released its jobs report this Friday, since Canada’s jobs report is coming out, too (September 7, 12:30 pm GMT). So if you’re looking to pillage some quick pips from the Loonie before calling it a week, then this top-tier catalyst is your best bet. And as it turns out, the actual reading decided to side with the historical tendency rather than the leading labor indicators because net employment increased by 26.2K, significantly beating the +14.0K consensus. And while the jobless rate held steady at 7.0%, missing expectations that it would tick lower to 6.9%, it’s not actually all that bad because the labor force participation rate ticked higher from 65.4% to 65.5%, which is a sign that Canadians were being enticed to join or rejoin the economy, and that’s a good thing. It gets even better because the uptick in the participation rate broke four consecutive months of deteriorating participation. Not only that, the details of the jobs report also reveals that the net gain in jobs was due to the 52.2K increase in full-time jobs, which were partially offset by the 26.0K decrease in part-time jobs. An increase in jobs is always a good thing, but all the more so after the loss of 71.4K jobs during the previous month. Overall, Canada’s jobs report for August looked pretty good, which is why forex traders initially tried to buy up the Loonie. However, attempts to buy up the Loonie were overwhelmed by selling activity just a few short minutes after the jobs report was released. What’s up with that? Well, one factor was that oil was already showing some weakness due to reports that the drop in U.S. oil inventories at the time was due to a tropical storm. A drop in oil inventories is usually taken as a sign of higher demand for oil, but since oil tankers were just delayed by the storm, the implication is that U.S. oil inventories would have been much higher at the time. 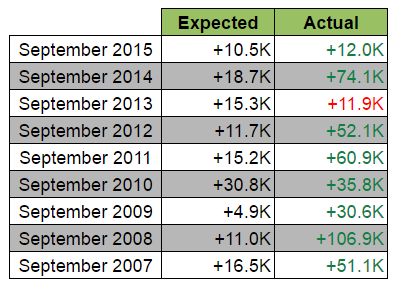 Getting back on topic, another factor was likely the jobs report itself. 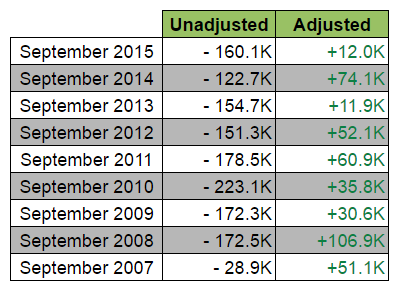 You see, an even closer look at the details of the jobs report shows that most of the jobs gain were actually from government jobs (+57.0K). The private sector only generated 8.3K jobs while 39.1K self-employed individuals lost their jobs. The weak job generation by the private sector and the large loss of jobs by self-employed individuals is actually a bad sign for the Canadian economy. However, the large increase in government jobs was able to cover this. For the employment situation in September, most economists say that Canada’s economy will generate 7.5K jobs, which would be enough to keep the jobless rate steady at 7.0%. Looks like employment in the manufacturing sector is in bad shape, huh? However, keep in mind that the manufacturing sector is just one, er, sector of the Canadian economy. And again, we don’t have the more comprehensive Ivey PMI yet. Looking at historical trends, the Canadian economy as a whole usually sheds jobs in September, according to the unadjusted reading. However, seasonal adjustments usually result in a net increase in employment. Moreover, it looks like economists tend to underestimate their forecasts, which is probably why the actual reading is often much better-than-expected. Based on historical trends, it’s therefore more likely that we’ll be getting an upside surprise. And as usual, a better-than-expected reading normally triggers a quick Loonie rally while a miss may trigger a quick Loonie selloff. For follow-through buying or selling, forex traders usually dig a little deeper into the details of the report, although oil’s price action is also a major factor. And you can check real-time prices of oil futures here.